The Tsuranqa Conundrum, written by Chris Chibnall and directed by Jennifer Perrott, finds the Doctor and her new companions stranded in a futuristic medical facility after one of their adventures has gone disastrously wrong on a junkyard planet. 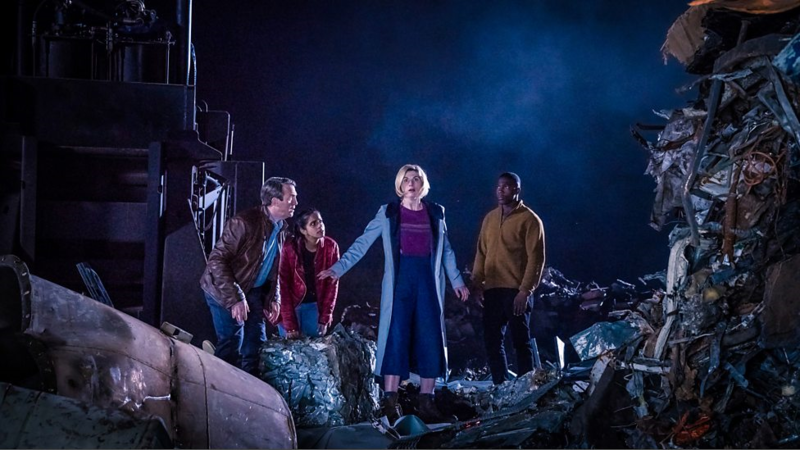 Jodie Whittaker’s Doctor is at the heart of the action, quickly discovering they are on board an automated spaceship bound for a medical space-station, but she’s far from the only hero here, and she inspires Graham, Yaz and Ryan to be as resourceful as ever to deal with their current predicament. Of course, the other patients with them in the facility also have a key role to play. The extensive guest cast for this episode includes Brett Goldstein and Lois Chimimba as the medics Astos and Mabli, actor and stand up comedian Ben Bailley Smith plays Durkas Cicero, and Casualty star Suzanne Packer is Eve Cicero. 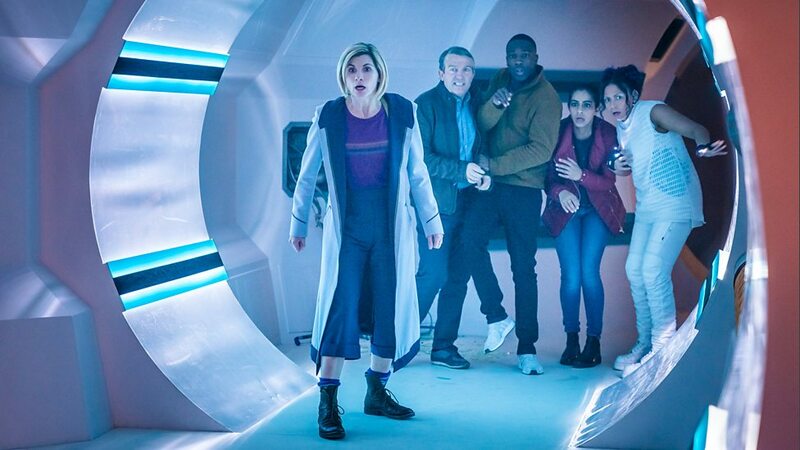 Chris Chibnall’s fast paced script hardly pauses for a moment, further heightening the danger faced by the Doctor, her friends, and the other patients in the facility. After the Earth based stories The Tsuranqa Conundrum is a welcome voyage into full on science fiction territory, boasting a glittering universe of sleek spaceships, new cultures, there’s a physics lesson veiled in anitmatter technobabble, and the Doctor and co even get to meet a pregnant male alien. 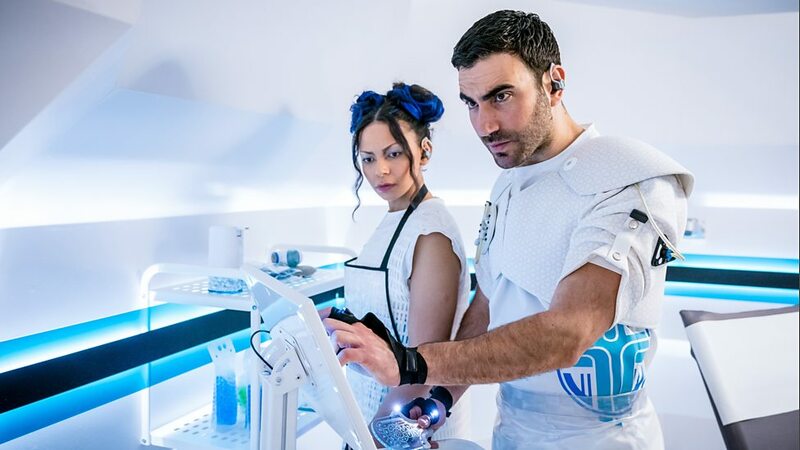 Australian director Jennifer Perrott and director of photography Simon Chapman (who is also Australian), have stylishly crafted this episodes vividly futuristic setting, the scope of it all is highly impressive, and the result is a truly remarkable looking Doctor Who adventure! The medical space-ships course soon takes the vessel into disputed territory. 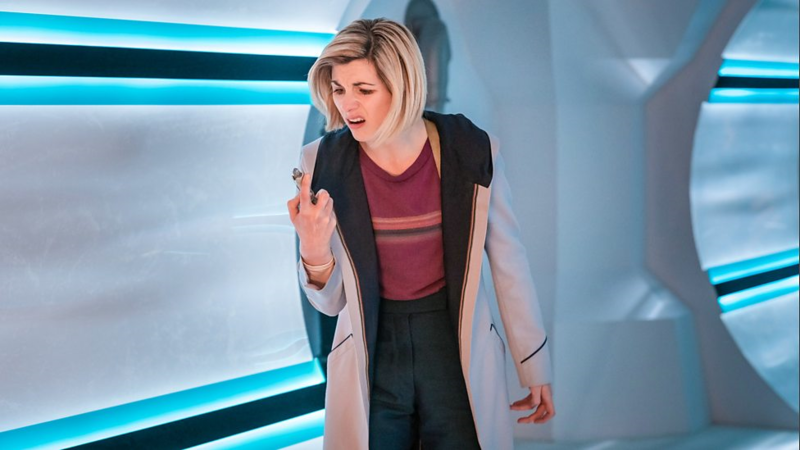 Before long a dangerous alien threat gets on board, a ferocious Pting (created and named by Tim Price room during series 11‘s early development), and its this diminutive monster that the Doctor encounters in this episode which presents a very new and different kind of threat for the Time Lord and her companions. The Ptng is a tiny, incredibly strong, speedy little beast with razor sharp teeth, toxic skin, and well known throughout the galaxy because of its voracious appetite for devouring all non-organic matter – including energy! Now… here’s where this review goes off on a slight tangent, because this is the point while preparing this review that I fell ill and got rushed into hospital. It feels a bit strange now, after just over two weeks, looking back over what I’d written about The Tsuranqa Conundrum while trying to gather my thoughts and opinions together in summing up this episode. To be honest my memory of it’s all a bit hazy, so I really need to see it again to judge it properly, but for now I’ll stick with the initial notes I made. Although exciting and fast paced, I felt that The Tsuranqa Conundrum was crammed almost to bursting point with a lot of good ideas, but sadly few of them were either developed successfully or worked collectively as a whole. The episode certainly put the Doctor and her companions though their paces, delivering strong character moments, but the supporting cast and frenetic plot made The Tsuranqa Conundrum feel overstuffed – a bit like the Pting at the end of the episode! The little Pting was actually The Tsuranqa Conundrum’s saving grace, the monster was a really fun and dangerous menace, and it thankfully brought the scripts lazy fix-all overuse of the Sonic Screwdriver to an abrupt halt – for a little while anyway. 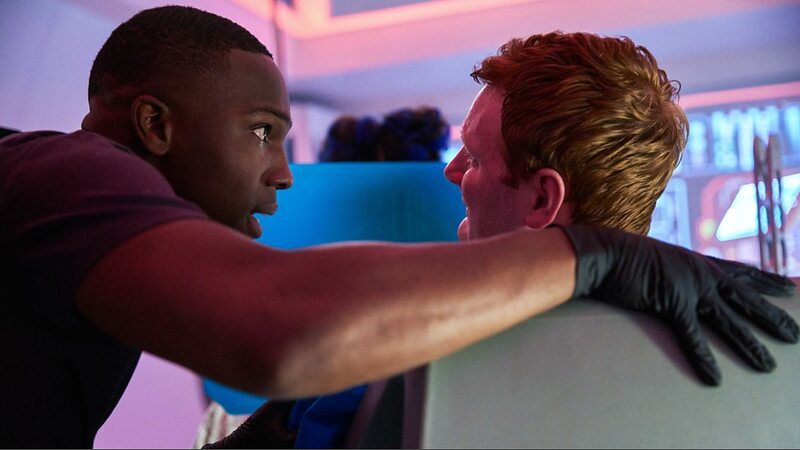 The Tsuranqa Conundrum is far from Chris Chibnall’s strongest script to date in series 11, however, the solid performances from the main cast, together with Jennifer Perrott’s stylish direction, and of course the insanely cute Pting do make up for some of the scripts failings. Reflecting on seeing The Tsuranqa Conundrum now feels very bizarre to me, especially considering the paradox of actually going into hospital myself after watching this episode. I will probably revisit this story again at some point, but strangely, just like any stay in hospital (no matter how well they look after you, and believe me they certainly did and I‘m immensely grateful for the care I received), its not necessarily something that I want to do again any time soon; and I think that sums up exactly how I feel about The Tsuranqa Conundrum as well. An above average Doctor Who story – but one that oddly felt like it was still a couple of drafts away from reaching its full potential. Glad you’re on the mend now Paul 🙂 I thought overall it was a good episode with an interesting setting, but agree it was rushed. Same old problem of trying to pack too much into a short time frame again. Bring back the two-parters maybe and allow more development? Thank you. I’m feeling a lot better now. Yes, it was a fairly good episode and premise, just let down by being so rushed. Funny really, as the episodes are all a little longer than normal this sereis, but a lot of the stories still feel like a bit of a rush to the finish line at the end. I do like how each episode has been different though, but I’d like to see the two part stories return as they give more room for characters and plot to develop. Hope you’re all better now! Yes, thanks, I’m on the mend and feeling better now. Just been taking things a bit easy for the last few weeks. I watched the first episodes in (was it?) 1964. I have seen the good doctor save the universe from a great number of perils including Amazon in this latest incarnation. Let us hope ythe scriptwriters continue to innovate! While overall, I think they’re good, I have been finding the last bunch of episodes pretty tedious to sit through. It just seems to me like there is some sort of spark missing. I’m going to stick with it of course, but I really hope they find that magic that makes Doctor Who special. I’m in the same mind as you really. I’ve enjoyed the season, for the most part, but it does seem to be missing the same energy as before. There have been lots of positives to this season, mostly the regular cast, but sometimes the stories haven’t lived up to their full potential. I’ll still stick with the rest of the season though to see what happens in the finale and the New Year Day special. I didn’t realize you weren’t feeling well. Glad to hear you’re better! Glad you’re getting better! You have a great excuse to binge watch a lot of stuff! This was a somewhat ‘average’ episode for me Paul, I really wasn’t sure what they were trying to achieve with all the various ideas and it quickly fell apart, I feel. A well written piece from you Paul, and interesting to hear such a personal account and how it relates to your experience in viewing and recounting your thoughts about the episode. Obviously it was a very harrowing time for you Paul and I’m glad to hear that you’re on the mend! Alas, I’m sticking with Tom Baker, and a handful of Pertwee and Davison stories, but that’s my lot from now on (or back? 😉 ), I’m afraid. Yes! Classic Who is ALWAYS 1st choice. Been studying some ishs of Dr Who Weekly lately, so want to blog about them at some point.